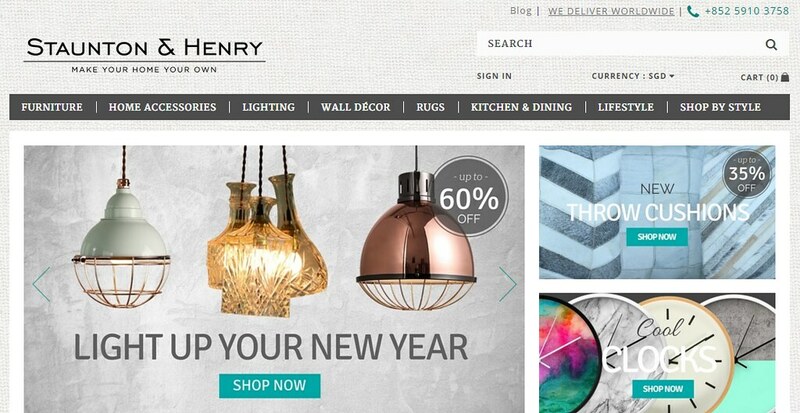 Staunton & Henry (hereinafter S&H) is Hong Kong’s leading online homeware store that ships worldwide. 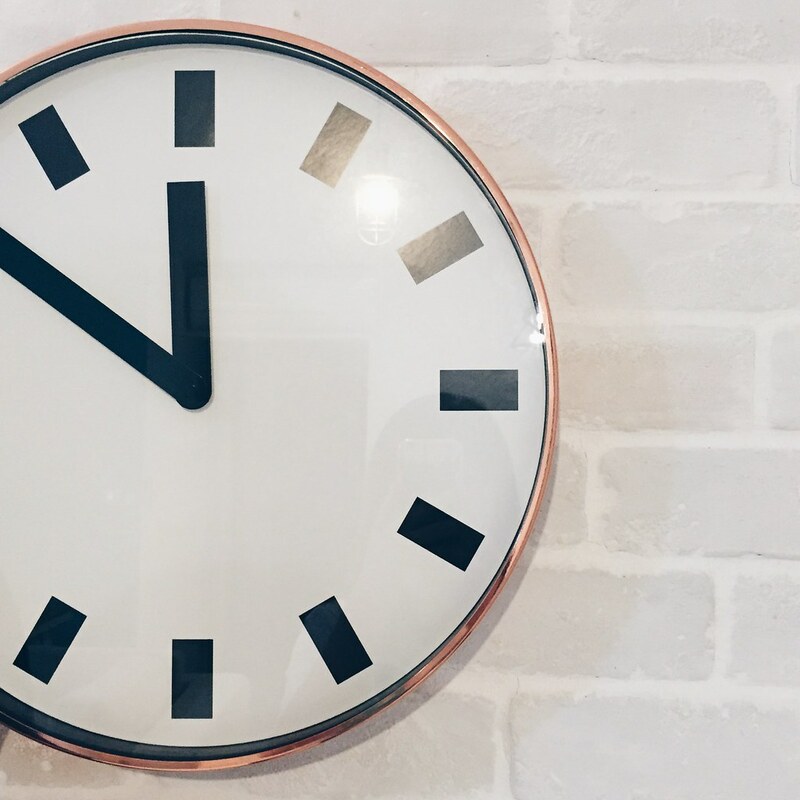 They offer a great selection of furniture, home accessories, lighting, clocks, wall decor and rugs that you won’t easily find in retail stores. 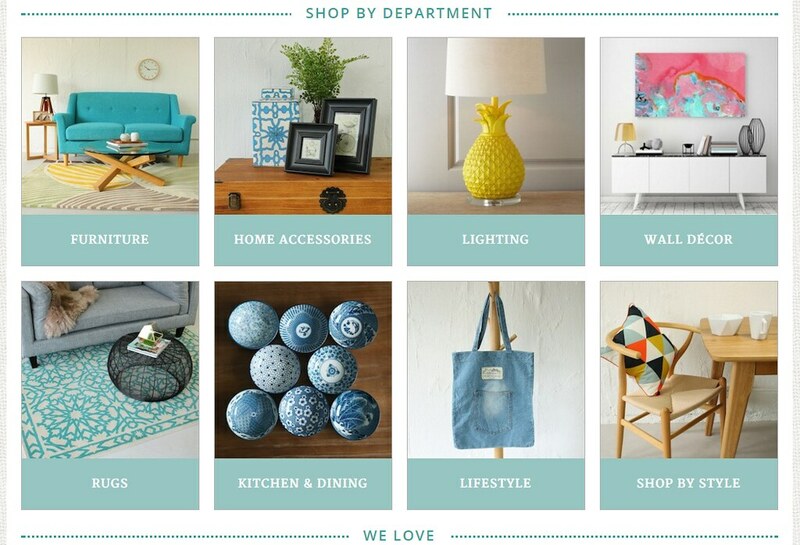 At one glance, Shop By Department features various items like furniture, lighting, accessories, etc. where you can browse at ease. With just one glance, you can easily select any category and go straight to your desired department to view further. Prices are pretty competitive compared to other stores. Payment can be made via major international credit cards and PayPal. S&H deliver pretty much anywhere in the world! They use Hong Kong Post Air Parcel service, which offers a very reliable and competitively priced service to over 100 destinations worldwide. Delivery starts at USD16 for the first 1kg, and USD4 for every additional 1kg, depending on your location. You may also check the weight of an item on the product detail page. The total shipping amount will be shown before you checkout. This is their promise that all their products are safe, high quality and offer excellent value for money. 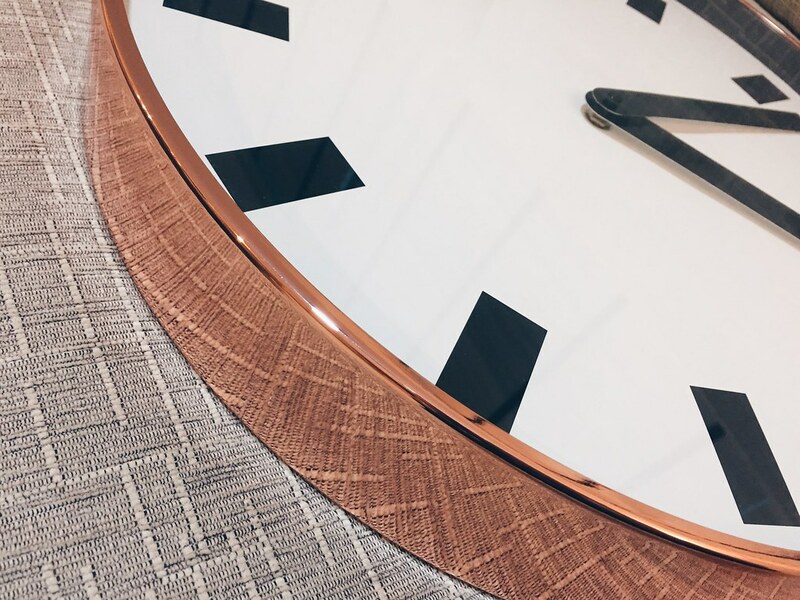 Should you be unhappy with any of their products, you may return it to them within 30 days (7 days for furniture) and get a full refund. 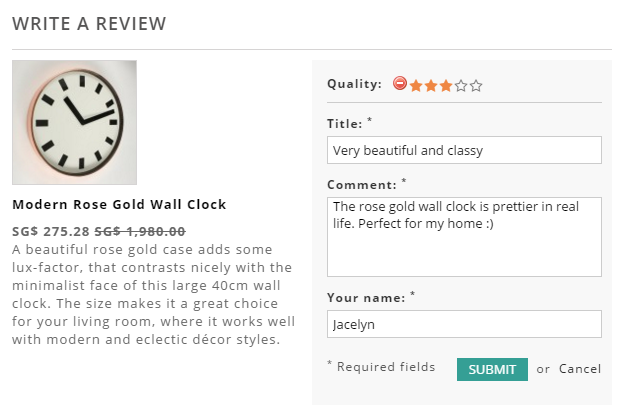 You may also click on any product to check out the reviews before purchasing. 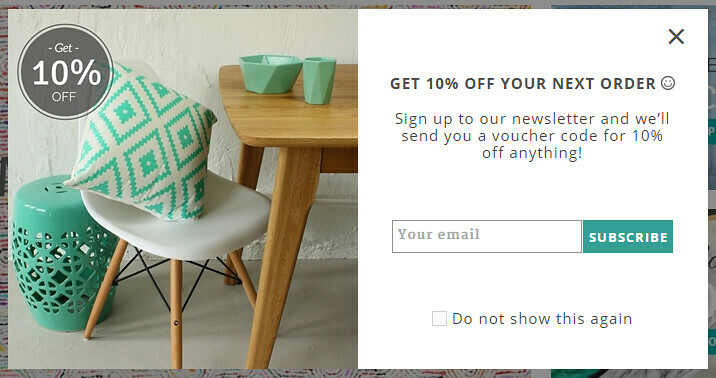 Furthermore, you may subscribe to their newsletter and get 10% OFF your next order! Update (30 Oct): I found some online reviews about them. They used to be called Ackerman & Smith, and this name still appears on the receipts. You may read them here and here. That Woon guy is also known as Eric. Update (20 Nov): So I wrote the review on Simmons Facebook page and they managed to pressure SleepSavvy to give me a call. 1. Telling me “Usually this kind of thing people won’t pay by installments.” By saying this, he is insulting me isn’t it? 2. He said “I thought I already told you?” in a rude manner and hung up my phone when I called him to check why didn’t he call me to update me on the machine’s delivery. I received a call from Verin again. She said a verbal warning had been given to Eric. I told her this is not sufficient as I want him to apologize to me personally. Then she said she want me to understand as Eric is someone from the “older generation”. What does she mean by that? Being in the older generation gives you the right to be rude to me? Also, I don’t think he is that old? Probably only in his mid-40s. I told her to give me a call again and also get Eric to call me. Service is everywhere, but good service seems to be rare these days. I don’t really write about bad services I have encountered unless I find the need to voice out my opinion. The recent one from this company called SleepSavvy really takes the cake. Let’s begin my story at the Asia Pacific Furniture Fair which happened from 22-30 August. According to the website, the fair was endorsed by Singapore Furniture Association. It makes my blood boil whenever I hear that name. I wrote them an email when I was in dispute with SleepSavvy but they don’t even bother to reply. Like seriously? Is the name there just for show? Consumer protection in Singapore is really unfair, very disappointing for home owners like us! We were there to shop for furniture and happened to see this huge signage “Simmons”. We then walked towards the booth just to try out the mattresses. A guy approached us, his name was Woon/Eric. He was decent looking and spoke very eloquently. According to him, he was from the HQ and “can make decisions and give substantial discounts”. We were eyeing for the bed in king size and he started using his calculator, making calls to someone to see how much discount he can give us. First impression was he seemed like a snobbish guy? This was the red flag and I hate myself for not realizing it. Anyway, I felt that the deal was pretty good. 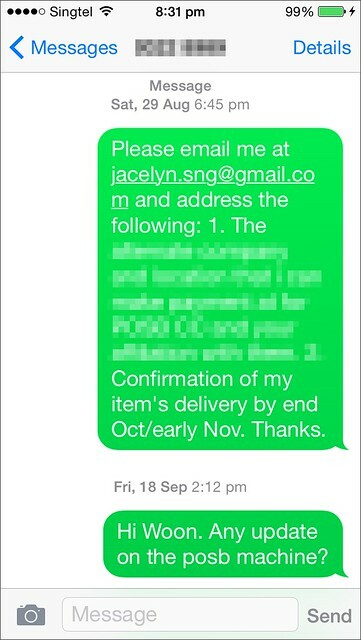 I told him that I will only buy it if I can pay by installments using a POSB/DBS credit card. Since the terminal was not at the fair, he made a call to his GM to check and see if I can swipe the card at their outlet instead. He told us his GM approved it and we made a deposit of $1200 and left the fair thereafter. We went to their outlet at Shun Li Industrial Park to swipe my credit card, only to realize that they don’t have the terminal. According to the staff, they don’t even have the terminal in the first place. 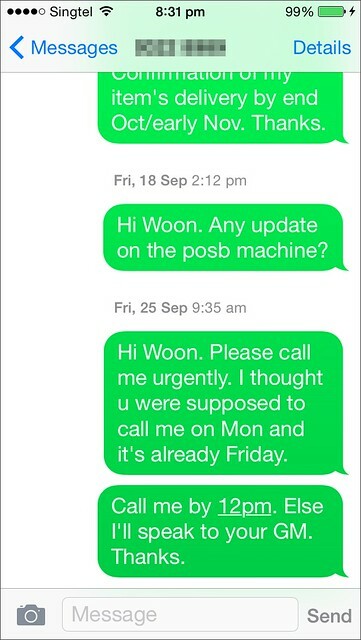 I called Woon/Eric and demanded to know why did he mislead us into buying when there wasn’t a POSB/DBS terminal?! I asked for a refund of my deposit which he refused to. Then he said “Usually this kind of thing people won’t pay by installments.” I was fuming mad when he said that. Lao niang wanna pay by installments he got problem with it? He gave us a solution but I shall not elaborate much in case I get myself into trouble. Anyway, I love what the hubby told him “Don’t make your problem our problem, solve it for us.” Even when we told him to email us for confirmation, he refused to. After a few calls back and forth, he told us that there was a terminal but the bank took it back for upgrading. He promised me that the terminal will be back at the outlet 2 weeks later and he will call to inform me. No updates 2 weeks later. SMSed him in the afternoon but he didn’t bother replying, so I called him in the evening. He mentioned that the terminal had already been arranged to return to the outlet by the following Monday. He promised to call me on 19 September to update me. No calls from him by evening time, so I called his mobile phone. He was very impatient and said “I thought I already told you that the terminal will be at the outlet on Monday?” The next moment, he hung up my phone! Called their office to check on the status of the terminal cos I don’t really trust that empty vessel anymore. I got to know that he’s only a sales manager? What’s with the “I can make decisions” when he’s not even the boss of the company? Tsk. Told the staff I wanted to complain to the GM and left a message to him, they don’t even bother to call me. Received a call from the office to confirm that the terminal is already at the outlet. I then proceeded to make the remaining payment before I flew off to Korea. The bed was finally delivered in good condition. Here’s my SMS conversation with him. To all new home owners, avoid SleepSavvy at all cost or authorised dealers in general. Strange that Simmons is still partnering with them when there are tons of bad reviews about them online. Please buy directly from the brands itself. Lesson learnt.